Horsley Printmakers return to the Biscuit Factory with a fresh crop of original prints. For the 4th year running this very popular exhibition will showcase the latest work from students, tutors - me and Rebecca plus our guest tutors Mandy and Chris from the independent program of courses offered by the studio. The prints below are a small selection from students Kim Lewis - the wood engravings, and Marion Prentice - the linocuts. We always have a great variety of subject matter and techniques to exhibit including lino-cuts, monotypes, collagraphs, etchings and wood-engravings. This year some of Horsley Printmakers more established students will show a larger selection of their work. Marion Prentice has made lino-cuts her own with some dynamic, figurative work. 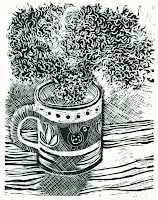 Stylish wood engravings and lino-cuts by Kim Lewis will also feature in the exhibition. An internationally renowned children’s book author and illustrator, Kim returned to printmaking primarily through courses at Horsley Printmakers. 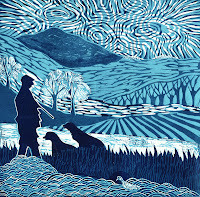 Rebecca Vincent will be showing all new monotypes, Carol Nunan her unique edition collagraphs, Mandy Pattullo has new floral monotypes and Chris Daunt his latest wood engravings. Horsley Printmakers is a printmaking studio based at The Hearth, Horsley in Northumberland. The Black and white prints are wood engravings by Kim Lewis which she made during several of our Wood Engraving courses with Chris Daunt. The linocuts were made by Marion Prentice another of our regular students. They are a combination of reductive prints, shaped plates and multi-plate prints. If you click on my profile and then on my webpage you will find out more about our workshops.